We are renewing the computer park at Foliovision these days. Five years ago we very wisely bought a fleet of Core 2 Duo computers which have served us well. Two years ago we bought a second fleet of Mac Minis to teach the programmers what a well designed operating system looks and feels like (before Apple started to break it on the way to merging telephones and computers: iOS and OS X) and to power our design department. We were very happy with the Mac Minis for a long time: they are reasonably performant, small and very quiet. But Core 2 Duo is getting a bit long in the tooth. Most of our team now works full time instead of going to school. The cost of their services has risen radically with their skills. The speed of their work has improved. Somewhere we need to squeeze some more efficiency out. Perhaps the impending arrival of Windows 8 has something to do with it. I've recently found a place to source genuine Windows 7 Ultimate licenses at €50. When the OS upgrade doesn't cost €200, I'm more inclined to upgrade our licenses and our existing computers, Microsoft. 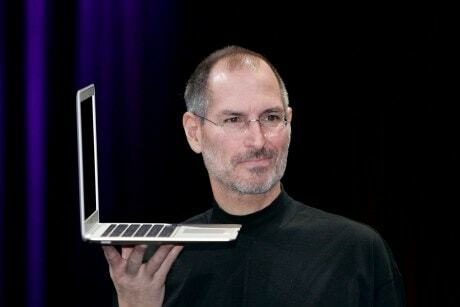 You finally figured it out, after Apple showed you the way (again). The plan is to add a bunch of quad computers now that you can buy fully decked out used ones at €300 or €350. I spent €1100 on my Q6600 back then (replacing a noisy G5 with a silent PC: still in service and still silent, with one replacement power supply and an SSD added). We like to buy used computers when we can, as it's a substantial contribution to reducing landfill. The great thing about desktops and non-Apple computers is that they are easily repaired whether it's power supplies, graphic cards, memory, hard drives or even motherboards giving up the ghost. Used is not a problem in a modular world. To keep the office looking good, we are careful to always buy very good looking computers in sober and attractive cases. The other rule is our computers have to be silent which means keeping a pile of nearly silent power supplies, slow big fans on hand and rubber grommets on hand. But even new computers need this TLC to get anywhere near quiet (inexpensive quiet power supply tip: the plain Jane Seasonic SS-350ET - the 500 watt version is even quieter, outdoing fancy dressed high end power supplies twice their price). So we may as well do reconstructive surgery on used computers as new ones. We really need quad processors now. Most of our team is in web development and would like to be able to see the sites quickly in several operating systems via virtual machine. Quality control should go up with more virtual machines in use. We'd also like more RAM as with multiple browsers open, lots of tabs and Firebug, one quickly runs out of headroom. We've been experimenting with the computers to know who is dealing with what. An invaluable tool has been Geekbench. It's cross platform so you can compare your Macs and PC's freely. It also seems to be quite accurate. While it favours multiple processors like hexacore i7 3930K (who doesn't), the benchmarks are still reasonable. You know that when a processor scores more with four cores (lightly overclocked i7 2600K) than with six (i7 980 extreme edition), you would be much better with the four. 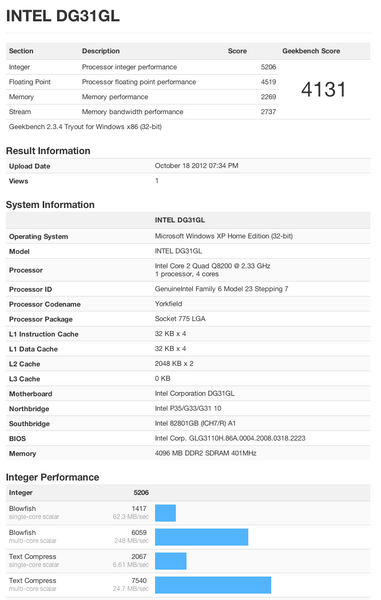 What is very nice about Geekbench are the very attractive and easy to read reports. On Windows and Linux (not on Hackintoshes), Geekbench will even let you know the exact name of your motherboard, the size and speed of your RAM in its launch panel. Very nice and very handy when dealing with diverse hardware already mounted in cases. Very useful basic system info, particularly on Windows XP which doesn't like to cough up the motherboard name very easily or even memory speed. I know from personal experience working on all these computers, that the mark where a computer feels fast is about where my Q6600 which only starts to feel sluggish when either rendering video, running 400 files through Aperture or Lightroom 4. Otherwise, I never feel a slowdown (on the i7 MacBook Pro even more so, with no slowdown for even Lightroom 4). My MacBook Air does get on my nerves when I have serious work to do (mainly a memory issue with only 4 GB). Today Peter brought in what should have been a very nice computer: a smart looking Q8200 with 4 GB RAM, Intel motherboard but in need of a video card. We have lots of those lying around, mainly GT210 and GT220's as they run 2D fast with lots of pixels but burn cool and silent. The seller tricked us: despite a very nice black sober case, the Intel motherboard DG31GL does not have a PCI-Express slot and there's almost no way to add a second monitor. While the onboard VGA only Intel 3100 graphics works okay, all Foliovision work stations use dual headed graphics. Something has to be done. 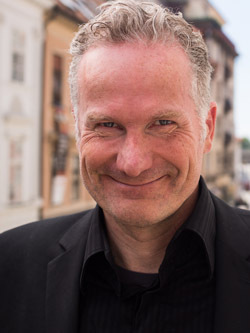 One: I could buy a PCI graphics card (Nvidia FX 5500 or GS 8400) with some effort for between €30 and €60. PCI is a an ancient bus, two generations behind for video which went through AGP and four revision upgrades as PCI Express. There's very little out there. Basically you have either the Nvidia FX 5500 256 MB or GS 8400 512 MB to choose from. Both of them are exponentially weaker than even a €22 GT210 or €30 GT220. Software/OS support at this point is inconsistent for PCI cards. Two: Alternatively for €42 we could buy a new Gigabyte G41MT-D3V motherboard which allows overclocking and some new DDR3 RAM (current RAM is DDR2 at 400 MHz, didn't know they made that). On the other hand that means reseating the processor and potentially buying a better heatsink to allow overclocking. Geekbench lets you peak at other people's overclocking efforts and decide if it's worth the trouble: certain processors overclock very easily without excessive power/temperature rises. 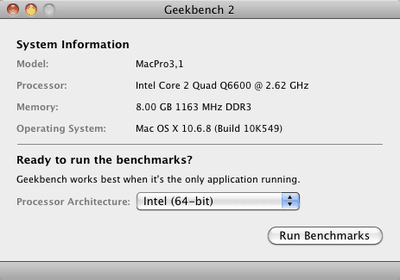 What's great about Geekbench browser apart from the separate and very clear Mac table with official and vetted results is the ability to search the results. The search is actually a filter: anything you put in your search string must appear, the rest disappears. There are no near matches, saving endless pain. Q8200 mac 64 gets you just 64 bit results on the Mac platform. On Windows, the Q8200 goes from about 5400 Score to 6600 Score with just quick overclocking to 2800 GHz (you can go to 7400 Score if you are willing to overclock to 3133 GHz, which is in line with the fastest dual processors of the current generation). 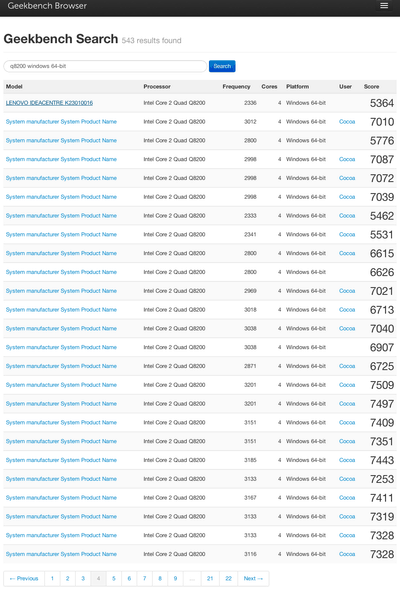 Geekbench search results: can you see the overclocking? The downside of a new motherboard means wasting someone's time rebuilding the computer and the trouble of moving a processor (removing the heat paste, adding new heat paste). 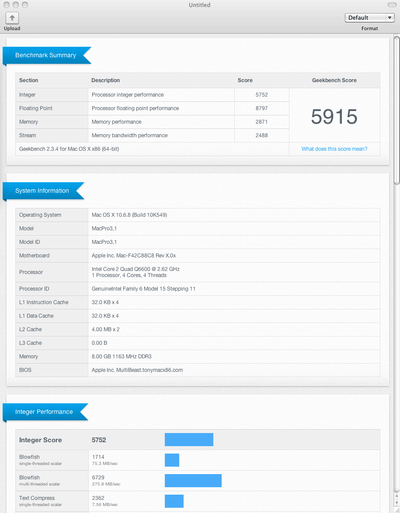 Current Geekbench results an astonishingly poor 4200 score, not much better than my Core2Duo 17" which I know from experience is no race horse. It's not worth spending another five minutes or €5 on a motherboard which is holding a processor back to three quarters of its worst basic performance. No PCI graphic cards for us. This old Q8200 is an inexpensive chance to learn how to apply heatpaste properly. Geekbench saved us the trouble of taking the wrong shortcut here (applying a quick slow graphics fix) and allowed us to identify a dog before it crept into our production routine. The other great use of Geekbench is a health check for any computer you are wondering about. Has a core in your processor burnt out? Is the RAM in fact short circuiting your requests? Any issues which show up in a Geekbench score off the norm for processor, motherboard and memory. I've bought a cross-platform license for Foliovision which we'll use on any hardware coming in the door. Geekbench receives a five V rating from Foliovision as essential and affordable maintenance cross-platform software tied to a brilliant and free online service (the results browser).